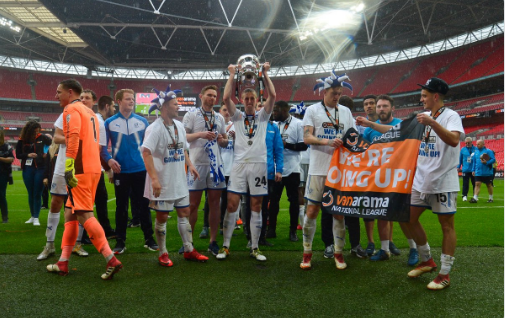 Tranmere Rovers gained promotion at Wembley after a hard-fought 2-1 win against Boreham Wood, as they won despite being down to ten men for nearly the entire match. Micky Mellon’s side certainly did it the hard way going down to ten men with under a minute gone and used all their substitutes before half-time. With just under a minute gone, Rovers were a man down when Liam Ridehalgh was sent-off for a tackle on Ricky Shakes. For some being reduced to ten men so early on may have led to less emphasis on attack for a period of the game, but not Rovers who took the lead with just over five minutes gone. The partnership of James Norwood and Andy Cook worked a treat for Micky Mellon’s side as the former put in a fine cross and the Vanarama National League top scorer was in the right place to head in. The frantic pace to the Vanarama National League promotion final kept going with both sides creating an opportunity. Thirty minutes were on the clock when Micky Mellon made his second change of the game with Connor Jennings coming on for Josh Ginnelly. Boreham Wood broke and Michael Folivi was well placed in the area but a perfectly timed Ritchie Sutton tackle ensured the ball went out of play instead of Scott Davies being tested in goal. Another stoppage in play this time involving Danny Woodards, who landed awkwardly, led to six minutes of added time being added. Incredibly Tranmere had to make their final change before the first-half was finished when Sutton was forced off with injury, Jay Harris came on and there was a tactical reshuffle. With moments to go until the whistle was blown Wood equalised when a pass across the area found Bruno Andrade, he finished calmly and the scores were level at the break. The second-half started with a chance for Tranmere after 25 seconds when Jennings on the angle forced Grant Smith into a smart save. Both sets of fans were urging their team to take the crucial lead, with Tranmere Rovers supporters chanting to encourage the side as they looked to overcome the man disadvantage. With the last quarter of an hour on the clock, the two teams’ defences were being made to work hard, with a fine block by Boreham Wood captain Mark Ricketts being followed a minute later by a crucial tackle by Rovers’ Harris at the other end. Tranmere would grab the lead again when Norwood was found in the area and he got just enough on it to beat Grant Smith, who was able to get a hand on it but couldn’t stop it going in. The Tranmere fans who had been loud throughout the game, encouraging their side, celebrated wildly but knew there was still ten minutes until they could enjoy victory. Rovers did an expert job of seeing the game out and there were scenes of jubilation as they secured their place back in the Football League.